Late in 2007 a group of 'area fiber people' thought this area was long overdue for a true fiber festival. You know the kind, we've all visited at least one or twice during our fiber journey. The scene…….. oodles of vendors, booths overflowing with hand-dyed roving and yarns, fleece fresh from the sheep, beautiful wood drop spindles lathe turned by a master and perhaps the unexpected artist selling the perfect hand felted vessels. Next, on to the barns……….a myriad of sheep, goats, rabbit, llamas and alpaca. How interesting to meet the animals that provide the fiber for our passion. The aroma from the stalls become hypnotic and we envision ourselves one day owning 'just a few' animals for our very own fiber stash! Well, we can dream and until those dreams become reality there are plenty of opportunities in the fabulous Southwest to meet our fiber needs! To that end, those crazy fiber people; ranchers, fiber artist and purveyors, decided to create their own fiber festival! They're gearing up; enticing vendors, ranchers and fiber artist from around the Southwest to Amado, Arizona, a lovely little spot south of Tucson. 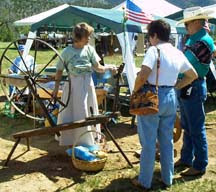 Come and join them for the 1st annual Southwest Fiber Festival, Saturday October 25th, 2008. Revel in the fiber, take a class, smell a sheep! Visit www.southwestfiberfestival.com for all the latest information. We are currently seeking; vendors, teachers and participants. We will have space for area guilds to host a booth; great for demonstrating, handing out literature and showing examples of guild interests.